CellCognition Explorer is an open-source image processing tool for the analysis of cellular phenotypes in microscopy. CellCognition Explorer enables phenotype classification by supervised machine learning. To detect rare phenotypes, outlier morphologies can be automatically found by novelty detection methods. A key feature of CellCognition Explorer is an improved classifier training procedure based on automated pre-processing of the full data set into cell gallery images, which can be automatically sorted based on phenotype similarity for efficient iterative classifier training. CellCognition Explorer is released under the GPLv3 and runs on Mac OS X or Windows. The main CellCognition Explorer program provides an integrated solution for image processing, feature extraction, classification by supervised machine learning or novelty detection. In addition, a separate Deep Learning Module program enables to calculate statistical features of cells by deep learning methods. The novelty detection and deep learning methods of CellCognition Explorer have been described in (Sommer et al., 2017). CellCognition Explorer has been optimized for efficient processing of medium-scale microscopy data. The software is part of the CellCognition project, which provides additional software, e.g., the CeCog Analyzer (Held et al., 2010) for high-throughput by batch-processing with computer cluster support. As an alternative to manual annotation of phenotype classes, novelty detection methods can be applied to detect outlier phenotypes. This is particularly powerful in case expected phenotypes are very rare. For details, see (Sommer et al., 2017). As an alternative to the standard feature set calculated by the main CellCognition Explorer program, the Deep Learning Module calculates features directly based on the pixels of original image data. The Deep Learning Module requires specific hardware for efficient processing. For details, see (Sommer et al., 2017). Held, M., Schmitz, M.H., Fischer, B., Walter, T., Neumann, B., Olma, M.H., Peter, M., Ellenberg, J., and Gerlich, D.W. (2010). 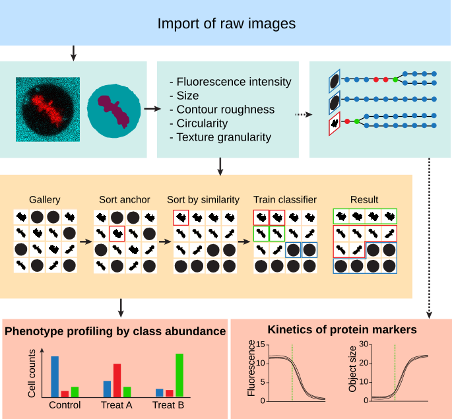 CellCognition: time-resolved phenotype annotation in high-throughput live cell imaging. Nat Methods 7, 747-754. Sommer, C., Held, M., Fischer, B., Huber, W., and Gerlich, D.W. (2013). CellH5: a format for data exchange in high-content screening. Bioinformatics 29, 1580-1582. Sommer, C., Hoefler, R., Samwer, M., and Gerlich, D.W. (2017). A deep learning and novelty detection framework for rapid phenotyping in high-content screening. Mol Biol Cell 28, 3428-3436. The Deep Learning Module is available as CPU-accelerated docker image and available from docker-hub including demo data. The program is released as open source software under the terms and conditions of the GPL v3. The source code and bug tracker are hosted on github. CellCognition Explorer is written in Python 2.7. For Windows users we recommend the Python 2.7 distribution WinPython. Most of the dependencies are included. Theano is the main deep learning library we use. Please, follow the general installation instructions for Theano on Windows or Mac OS-X/Linux. Lasagne is a convenient high-level interface to Theano for building deep artificial neural networks. nolearn builds upon lasagne and offers special neural network classes and custom layers. cellH5 is high-content screening data format, which serves as input for CellCognition Explorer and as exchange format to other software such as CellProfiler and Fiji. Download cellcognition_explorer_cedl-master.zip and unzip the source code of version 1.0.0. For future releases, please, refer to the code repository on github. One can use CellCognition Explorer GUI with ready-made demo data based on 239 morphology feature descriptors and various novelty detection algorithms. 10,000 representative images of HeLa cells expressing histone 2B fused to mCherry (H2B-mCherry) were randomly subsampled from a high-throughput microscopy experiment, as described in Figure 2 in Sommer, Hoefler et al., MBoC, 2017.
manual_10k_annotated_images.h5 - hdf5 file containing autoencoder features, morphology features, novelty detection prediction, support vector machine prediction and meta data. The Deep Learning Module can be tested with these demo data, which are also included in the software bundle and automatically loaded in the Deep Learning GUI. The CellCognition Explorer main software has been developed in the Gerlich laboratory at IMBA, Vienna BioCenter, by Rudolf Hoefler (main CellCognition Explorer software) and Christoph Sommer (Deep Learning Module).